University of Michigan Press, 9780472037254, 342pp. Yiddish Empire tells the story of how a group of itinerant Jewish performers became the interwar equivalent of a viral sensation, providing a missing chapter in the history of the modern stage. During World War I, a motley group of teenaged amateurs, impoverished war refugees, and out- of- work Russian actors banded together to revolutionize the Yiddish stage. Achieving a most unlikely success through their productions, the Vilna Troupe (1915– 36) would eventually go on to earn the attention of theatergoers around the world. Advancements in modern transportation allowed Yiddish theater artists to reach global audiences, traversing not only cities and districts but also countries and continents. 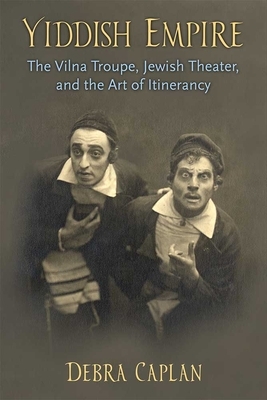 The Vilna Troupe routinely performed in major venues that had never before allowed Jews, let alone Yiddish, upon their stages, and operated across a vast territory, a strategy that enabled them to attract unusually diverse audiences to the Yiddish stage and a precursor to the organizational structures and travel patterns that we see now in contemporary theater. Debra Caplan’s history of the Troupe is rigorously researched, employing primary and secondary sources in multiple languages, and is engagingly written. Debra Caplan is Assistant Professor of Theater at Baruch College, City University of New York.